Caption: New blood test of gene activity reveals who will respond to aspirin therapy and who won’t. 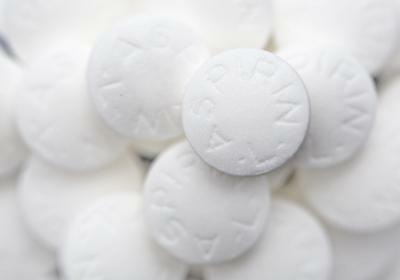 About 60 million Americans take an aspirin a day to reduce the risk of strokes and heart attacks. But for 10 to 30% of those who follow this recommendation, this preventive therapy turns out not to offer any protection. An NIH-funded team, based at Duke University Medical Center, has discovered a set of blood markers that predict who will benefit from aspirin therapy and who will not . First of all, I’ve got to tell you that acetylsalicylic acid, the scientific name for aspirin, is a pretty amazing drug. German chemist Felix Hoffmann synthesized the first commercial form of the drug more than a hundred years ago to treat headaches, minor aches and pains, and fever—and we’re still discovering nuances about how the drug works, for whom, and for which diseases. Aspirin reduces the risk of stroke and heart attack by changing the properties of platelets, which are sticky, gelatinous disc-shaped fragments of cells that help repair damaged blood vessels. The correct balance of platelets is important for good health. Too little platelet activity increases the risk of bleeding; too much boosts the risk of blood clots that can cause strokes and heart attacks. Low doses of aspirin make the platelets less sticky and thus less likely to form clots. This has been a mainstay of reducing heart attacks and stroke, particularly in patients who’ve already suffered from one. There are already tests that can determine whether aspirin reduces platelet stickiness in an individual, but they’re impractical in clinical practice because of their expense and technical difficulty. To find a better way to identify non-responders, the researchers measured the activity of platelets in patients with heart disease and healthy participants who took aspirin, and studied the activity of genes (specifically, by measuring RNA levels for individual genes) in whole blood samples. The scientists discovered an “aspirin response signature”—an activity profile of 60 genes—that revealed whose platelets didn’t respond to aspirin (that is, their platelets were still sticky). Interestingly, many of the genes that turned up in the signature were expressed in platelets, rather than in other blood cells. The diagnostic signature predicting aspirin resistance was also associated with deaths from stroke or heart attack. People who don’t respond to aspirin may need a different dose of the drug or perhaps a different antiplatelet drug entirely—there are quite a few options out there. Heart disease is the number one killer for men and women in America; it claims about 600,000 lives each year and costs the country about $108 billion . The researchers plan to expand their analysis to other patient groups. If the results are consistent, they may be able to develop a commercial blood test to identify non-responders—maybe even before they start taking aspirin. Such a blood test could help people avoid unnecessary medication and its associated side effects such as gastrointestinal bleeding. It’s another example of how studying gene activity can lead to personalized medicine. Aspirin Exposure Reveals Novel Genes Associated with Platelet Function and Cardiovascular Events. Voora D, Cyr D, Lucas J, Chi JT, Dungan J, McCaffrey TA, Katz R, Newby LK, Kraus WE, Becker RC, Ortel TL, Ginsburg GS. J Am Coll Cardiol. 2013 Jul 2. Deaths: Final Data for 2009. Kochanek KD, Xu J, Murphy SL, Miniño AM, Kung H-C. National Center for Health Statistics. Vital Health Stat. 60(3). 2011.